The former Salt Lake City mayor is mounting an unlikely protest against American plutocracy. 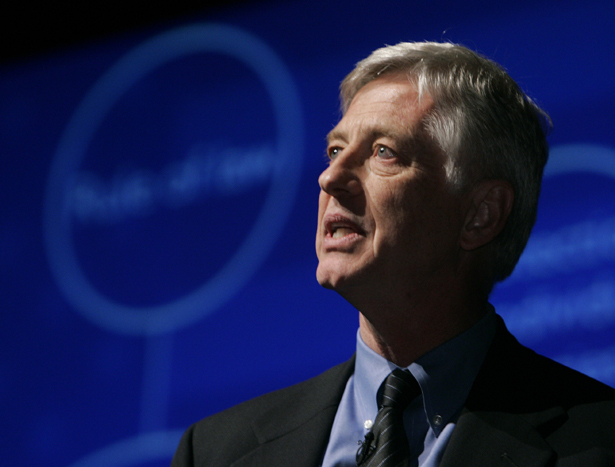 Rocky Anderson has long been a leading light among American progressives. As mayor of Salt Lake City for eight years, he championed important reforms in education, anti-drug strategies, housing, environmental protection, public transit and other key areas. Where many mayors focus solely on local issues, Anderson was vocal in his critique of Bush-era foreign policy, going so far as to lead a demonstration against the president when he came to Salt Lake to address an American Legion convention. After Anderson left office, in 2009, he went on to direct a human rights group that focused on torture and other issues of the day. In late 2011, he co-founded the Justice Party and announced that he was running for president in 2012 under its banner. I recently spoke with him in his office about his platform, the role of third-party “spoilers” in US politics and the slippery slope toward executive tyranny. Sasha Abramsky: Why are you running what many might consider to be a quixotic campaign? Rocky Anderson: I don’t agree with your premise about the nature of the campaign. It’s an uphill task, of course, but there have been a number of third-party candidacies in our nation’s history that have made a tremendous difference. Teddy Roosevelt, although he lost his election when he ran as a Progressive Party candidate, actually won, because many of the things he campaigned on ended up being implemented into law: the eight-hour workday, old-age pensions, unemployment insurance. Ross Perot made a tremendous difference. Neither Clinton nor Bush were talking about budget deficits, fiscal responsibility, until Perot became a very important part of that campaign. So I think that, especially now, there is a perfect storm brewing in connection with third parties. Almost all of the polls show a majority want to see a major third party. They are unhappy with what Republicans and Democrats have to offer. Why not run as a progressive Democrat in 2016? I don’t seek to participate with the Democratic Party because I think it is irredeemable. The party and its candidates are feeding at the same trough of special-interest money as the Republicans. They have sold out every bit as much or perhaps more. We have a plutocracy in place: government of, by and for the wealthy. Every public policy disaster can be explained by following the money. We’re the only nation in the industrialized world that doesn’t provide healthcare for all its citizens. We pay twice as much with very poor or mediocre medical outcomes. Why is that? Because of the influence of corrupting money from the insurance and pharmaceutical industries. Take a look at the stranglehold the military-industrial complex has on our country. Republicans and Democrats alike support the waste of billions of dollars simply so they can keep these contractors happy. How do you propose to address such deeply rooted problems? We need to take things in a completely new direction with a new system. Public financing of campaigns. Repeal, even if it takes a constitutional amendment, the incredible decision in the Citizens United case. It’s time to get back to the fundamental values underlying our constitution: the notion of a republic, with a balance of power, a system of checks and balances, due process, habeas corpus. Do you consider the Democrats irredeemable on these constitutional issues as well? What we see right now is a very fractured society, one in which we have a two-tier system of justice, where the laws are applied with a vengeance against the 99 percent but where there is an elite class of people able to skate by, commit federal felonies and have the president and his administration say, “Let’s just forget about it.” After Obama was sworn in, we had him say about war crimes, torture, “Let’s just move forward and not look back.” That’s the very definition of tyranny. He’s saying not only the law doesn’t apply to him but he gets to decide against whom the law will be applied and under what circumstances. It’s the same with those who committed felonies under the Foreign Intelligence Surveillance Act, in engaging in illegal, warrantless surveillance on US citizens. This is perhaps the most frightening thing: the executive branch can violate the law, and when it’s challenged by victims it argues the court needs to dismiss the cases because to continue would mean the disclosure of important state secrets. We have a president who adds citizens’ names on assassination lists. Obama, in 2009, requested the power to indefinitely detain, without any semblance of due process, people anywhere in the world, including US citizens. Congress recently passed this with the National Defense Authorization Act, and the president—on New Year’s Eve, so people wouldn’t be paying attention—signed it into law, providing that our government can pick out anyone, anywhere, kidnap them, hold them incommunicado. They don’t have the right of legal counsel, or habeas corpus, the right to hear charges against them or to a trial. And they can be held for the rest of their lives. That is a recipe for Gulag America. It’s probably the most un-American act ever passed by Congress. You’re describing what sounds like the emergence of a new way of governing America. Where are the historical parallels? There are amazing parallels between the Roman Empire and what we’re seeing in the United States now. There was a republic, a commitment to a system of government that represented the people. The Tribune, elected by the people, could actually veto the Roman Senate. Then, of course, there were those who started accumulating more power, starting with Caesar. This chain of emperors took over and completely transformed what had been a republic. That’s very similar to what we have seen in this country. We, as a nation, have been incredibly resilient to those who assert they have these dictatorial powers, until about the last dozen years. One huge danger has been this partisan approach to politics, where if somebody on your team is doing it, you shut up about it and don’t rise up in opposition. And that’s why I say Obama is not the lesser of two evils in this election but the more effective evil: he’s getting away with things that Bush or Romney wouldn’t get away with without incredible opposition from the Democratic Party. If you were elected president, how would you act differently? How do we know that, when confronted with National Security Estimates, you wouldn’t be pushed into unsavory positions? You look at the core of the individual, look at what they’ve done with their life. I’ve practiced law for twenty-one years; I did a lot of civil rights work, a lot of constitutional law work, a lot of volunteer work, including for the ACLU. I have an unalterable commitment to the rule of law. We can’t excuse, under the pressure of current circumstances, the creation of a tyranny, the abandonment of the rule of law. In the long run so much more damage is done to our country by giving these processes short shrift. The primary reason I’m doing what I’m doing is because of my deep concerns about what’s happening to our nation, about the ratcheting up of the imperial presidency and the destruction of our constitutional values and, fundamentally, our moral values. What if you tip the balance and there’s a President Romney come 2013? Well, the question about the spoiler is actually what kept me from doing this for a long time. The reason I decided to do what I’m doing now is because, if the threat of being a spoiler is always going to trump trying to alter the system, then we will never see that kind of change. You cannot let the fear of being a spoiler stop us from raising our voices and taking action, doing everything we can to change the dangerous course on which this country is headed. Do you agree that there are some areas where Obama has been fairly progressive: gay marriage, for example? No, he’s a phony. What he did on gay marriage was so boldly political. He used to say he was against it. Then he said his position was evolving. Really? His position on equality was evolving? Now he says he supports marriage equality, but what does that equate to? He says, “I favor it, but it should be left up to the states.” Would he have said that about racial or religious equality? Equality for members of the GLBT community doesn’t rise to the level of importance to provide federal protections? That’s why he’s so dangerous, because there’s this pretense. Do you worry your candidacy could help enable an extreme-right Republican Party? No. It could be I take more votes away from Mitt Romney. In the first poll that was done after I announced my candidacy, when Romney and Obama were paired just the two of them, Romney won by 2 or 3 percent. When I was added in, Obama won. I took more votes away from Romney than Obama. The reason for that is there are people who, no matter what, will never vote for Barack Obama. When I’m put into the mix, they’ll go with me instead of Romney. A miracle happens: you get elected in 2012 and re-elected in 2016. After eight years of a Rocky Anderson presidency, what does the country look like? The country is back on constitutional moorings. We will not make war without an explicit authorization from Congress. We won’t be engaging in illegal wars of aggression anymore. We will never again waver on the right of habeas corpus, due process. We will not have the kind of enormous disparity of wealth and income that we see now. We will be past this new Gilded Age, back to a time where we have a healthy, thriving middle class, where we have good jobs, the strongest educational system in the world, where we provide early preschool programs through higher education, equal educational opportunities for everyone. This nation would be one where no one is above the law and everyone—at every level, regardless of wealth, regardless of political position—knows that he or she will be held accountable for violations of the law. We’ll talk about all of us being in this together, all of us paying our fair share, all of us sacrificing for the good of the country and enjoying the benefits. The prohibition of drugs will be eliminated, and substance abuse will be treated as a public health and education issue. We will finally be providing the essential leadership on climate protection, because if we don’t do that, that window of opportunity that’s so narrow right now is going to be slammed shut.